Ensure that your minced beef is finely chopped. On a flat, hot pan, heat the serving leaf and kocho, turning them over so they don’t burn. Now, in a pan, lightly fry/heat the gomen and season it with 1 teaspoon of berbere, 1 tablespoon of the kibbeh and 1 teaspoon of mekelesha. After about two minutes on the pan, transfer it to your serving dish. Next to it, include the ayib. In a small pot and on low heat, mix together a cup of kibbeh, 2 tablespoons of mitmita, and 1 tablespoon of mekelesha. Stir for about a minute before removing from the fire. Thoroughly mix the tartar in with the mitmita, mekelesha and kibbeh blend. Once this is done, put it back on low heat, continuing to mix. Lightly cook for ±1 minute and add a little bit more kibbeh if necessary, to prevent the beef from sticking to the pot. Serve the kitfo on the False Banana leaf. Drizzle a teaspoon of kibbeh on the kitfo and side dishes of gomen and ayib. Plate with injera and kocho. 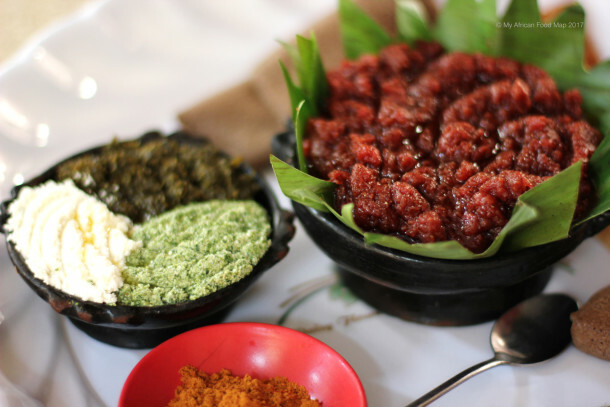 Workenesh Menji is one of a skilled team of chefs at Gursha, a new restaurant in the centre of Addis Ababa. Each dish is prepared with care and attention and the restaurant is spacious, comfortable and beautiful. “My favourite food would be kitfo, of course. Yes, kitfo – I love it because… Like I said, it’s the butter. The way they make the butter – the way they season it; even the seasoning – the spices they put in there is so beautiful. Well, it’s something like tartare. The beef tartare, or the French dish. But then, you can picture this with well-seasoned butter and then you have the spice. Like the hot, chilli spice. Of course kitfo can be made in different ways. Some of them like it a bit cooked, some of them like it just raw. It’s very good. It’s just got that feeling. Especially along with ayib, which is – we also call it… we may call it sour cheese. Yes, ayib that is. And then, on the side we can have kocho, which is made of the False Banana tree. It’s like a bread, but then very nice taste. It’s just amazing.